Discover Bell Ringing is a website which includes country-wide contacts with local Associations and Guilds. Helen Webb will also run Calling Call Changes at nearby towers if enough people are interested. Please let us know. It has been a somewhat difficult time finding a hotel that was even interested in accommodating a group of our size at a reasonable price. Most of the projected area of choice along the South Coast - were either too expensive, or simply not interested. However both Margaret and I are aware that there is an increase in costs despite our best efforts but we hope that you will still be interested in supporting and enjoying the holiday. The costing includes the hotel/bed/breakfast/evening meal, coach and gratuities, tower fees and hovercraft trip. The provisional programme is here and booking form is here; we shall be happy to receive completed forms and deposits at your earliest convenience. My name is Anthea and I am the Programmes and Events Officer at Big Idea, an organisation that creates programmes which encourage community participation, inclusion and cohesion across the arts, heritage, science and sport. For more information please visit our website www.big-ideas.org. One of our key projects for 2018 is Ringing Remembers, the national campaign to recruit new bell ringers in memory of the 1,400 ringers who died in World War One. On the 19th of August, we will be at St Mary's Longstock to commemorate and celebrate ringers of Longstock, and more broadly women taking part in ringing across the country during WW1. We would be delighted if you were able to join us for this very special moment. We have found the descendants of the Vicar in the photo; his great grandson, great granddaughter, and three great-great-granddaughters. They are all ringers today. On the 19th, they will be involved in the ringing event to commemorate this historical moment alongside new Ringing Remembers learners. Current campaign learners are invited to come along to mark the moment with ringing, and new potential learners can try ringing during a taster session. For any more information, on either Ringing Remembers or the event in Longstock, please email bells_at_big-ideas.org. The following report, from Robert Wellen, Guild Master of the Salisbury Diocesan Guild of Ringers, was printed in 'Face to Face', the SDGR newsletter, and is included here with permission and by request. It is not customary for mention to be made in this publication of the activities of other Guilds and Associations. But I feel that mention must be made of the National AGM of the Ladies‘ Guild which this year was held in the Diocese of Salisbury on Saturday 16 June. I had the pleasure of being invited to represent the Salisbury DG and many Salisbury Guild members, including our President and Guild Treasurer were there, 'with different hats on‘. There was ringing in the morning on a route from Stourton through Gillingham to Shaftesbury, with a service at St John‘s church, Charlton with tea at the Remembrance Hall. The uplifting service was led by the Reverend Richard Warhurst. I joined Christopher Sykes (Captain at Donhead St Mary) for ringing with the non-Ladies whilst the meeting was going on, before returning to the Hall for a 'magnificent tea‘. The theme of the arrangements was the centenary of women‘s suffrage and this was reflected in the colour scheme and a special cake. St Clement Danes for the quarter peal day. Quarter peal day at St Clement Danes, today. Two of the four quarter peal attempts were scored (details here): it didn't help that we were under pressure because of timings, but there was some stonkingly good striking in the quarter peals that were lost. The dedications for both quarter peals is "To celebrate the 100th anniversary of the passing of the Representation of the People Act on 6th February 1918 by which women in the United Kingdom first got the right to vote"
In the post-ringing pub-session after the Guild quarter peal day at St Clement Danes in January of this year, Dawn Neville suggested that a similar event could be organised in Liverpool: four quarter peals could be rung during the day and then we could go to the Liverpool Cathedral practice (if you were willing to get in a lift, which I am not, but it was still a great idea for everyone else!). Although in the clutches of post-event-organiser-fatigue, I agreed that it sounded good...it sounded even better when Dawn offered to organise the towers so that I would only have to organise the bands. True to her word, Dawn did a sterling job of organising the weekend. We struck lucky when Roger Franks of St Barnabas, Penny Lane agreed that all four quarter peals could be rung there. Pier Head agreed to being invaded by about fifteen visitors at their practice on the Friday evening; three towers were fore-warned that they may have visitors joining them for service ringing on the Sunday morning; and a booking for about 25 people was made at the Philharmonic Dining Rooms for the Saturday evening. Not everyone who wanted to was able to make the practice at Pier Head on the Friday evening, courtesy of the M6! However, those ringing in the first quarter peal on the Saturday morning all made it to Penny Lane in good time. After ringing a plain course of Grandsire Triples so that the three associated Laddies in attendance could grab the bells, the first quarter began. All four quarter peals were scored. While we were not ringing we were able to sit in the church, drinking tea and coffee, consuming biscuits (big thank you to Dawn and Jeff for providing! ), and catching up with friends from other districts. A total of 22 members rang: 17 from six of the other districts in the UK, and 5 from North Western district. A fifth quarter peal was rung at Garston; the band was composed of the three associated Laddies, one Lady, and four locals. There was time between finishing at Penny Lane and the start of the practice, to have a look round Liverpool Cathedral. That morning I had said to Dawn and Jeff that I wouldn't bother going to the Cathedral because I wouldn't use the lift; Jeff said that he would check and see if the doors to the staircases could be unlocked...I wasn't sure how I felt about this! While the others were queuing for the lift, one of the Cathedral Constables, who is also a member of the Cathedral band, turned up and agreed to unlock the door to the first staircase and walk up with me - to check that the door to the nave roof-space was unlocked. Together with another visitor, we started walking up the stairs: I paced myself! I felt somewhat cheated at having to walk up a short flight of steps, only to have to walk down again on the opposite side in the nave roof-space; but then we started climbing the second staircase. My pace was somewhat slower, but we reached the door and entered what must be the largest of ringing chambers, with the doughnut looking dwarfed by the girders that criss-cross the vast space. The Cathedral band were very accommodating and supportive, and we really appreciate that they gave up so much of their practice so that 20+ visitors could experience ringing their bells. I found ringing round the back easier than the front; as one of the locals said, the heavier bells have a rhythm of their own, whereas the front bells have to be held up for what initially feels like an excessive amount of time. Everyone had a go of at least ringing rounds on the 12, including the two people who were not particularly keen but who I "encouraged" to take the opportunity while they were there; retribution was swift and I was soon strapping the tenor to plain hunt on eleven. A touch of Little Bob Royal was also rung, with some members of the Guild in the band. More people accompanied me descending the stairs than there were on the ascent. I'd been asked how many stairs there were but I hadn't counted on the way up; Rosemary Tuhey kept count of the 300+ steps on the way down. The Philharmonic Dining Rooms are a short walk from the Cathedral. Tosh and Lorna kindly carried between them the bag of bottled beers that was a thank you gift for Dawn; it was interesting to watch them navigate their way around lamp posts and art installations as they walked along Hope Street; I was somewhat puzzled by their detour across the road to the Philharmonic Halls, but they soon realised their error and headed back in the right direction! Sunday morning saw a number of us successfully ringing at three towers for Sunday service: thank you to the tower captains and ringers at Pier Head, St Francis Xavier, and Tuebrook for making us all welcome. It was a great way to finish a successful weekend. Details of the quarter peals rung at Penny Lane are here. Details of the Ladies Guild holiday offer for 2018 are now available (provisional programme and booking form). There has been a long standing wish for a holiday in Worcestershire, but this has proved a difficult area to book for our specific group needs. However we hope you will agree that we have found a very good option in neighbouring Warwickshire - https://www.southcrestmanorhotel.com - which will still allow us to head off to Worcestershire several days. Although the holiday costs are based on full board, we will need to go off site for the evening meal after our arrival (Sunday 13th) as there is a wedding party at the hotel. The cost of this meal is included in the holiday price, and we will send more details nearer the time. We have included the cost of the 2hr canal trip in the price but not the walk around Stratford. Please indicate on the form your wishes. We look forward to receiving your booking forms and deposits in due course. Final programme now available here. The holiday is fully booked, but visitors for individual days are welcome. I have just been informed of the death of one of East Midlands district most loyal members at the age of 93. Edna Bradley was a remarkable woman, who learned to ring in her 70s. She only ever rang one quarter peal and that was with the Ladies Guild but she was a great enabler of others. She became tower captain of Clarborough in North Nottinghamshire, and arranged for the teaching of a band from the village. 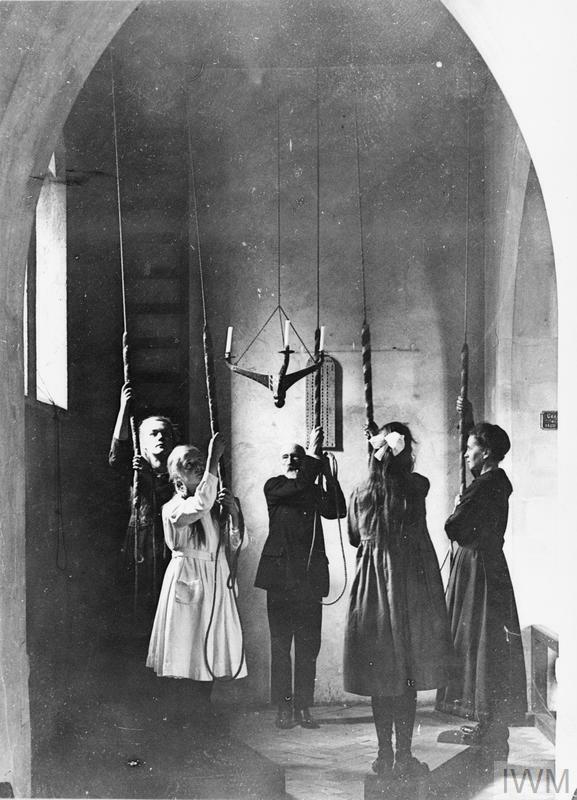 Later her infectious energy and enthusiasm led to the augmentation of the ring of 6 to 8 bells; the two new bells and the necessary changes to the treble and frame being paid for by Edna. The bells are now rung regularly and there is no doubt that this is largely due to Edna. If you ever get to ring at this lovely church spare her a thought. For details of ringing, and suggestions for accommodation see AGM. This is preliminary information, tea and ringing tickets will be available nearer the time. 12/03/2017 - Agenda for the AGM is now included on the AGM page. Freda Cannon, a former President of the Ladies Guild and Vice-President of the Kent District, passed away peacefully on the 14th January. Freda's funeral service will be held at St Alfege, Greenwich, at 1.15 pm on Tuesday 14th February. 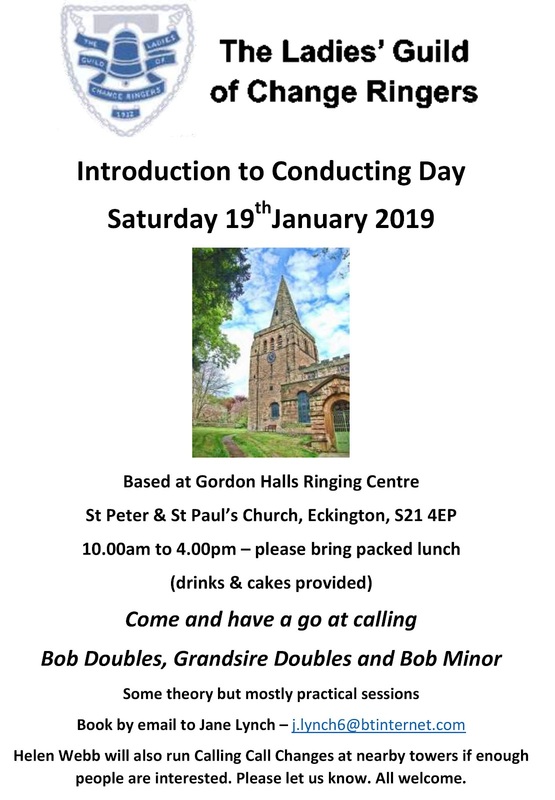 There will be general ringing before and after the service. It is with the deep regret that we have to inform you of the sad loss of Jill Staniforth, who passed away on the 7th January 2017. The family would like to advise you that there will be a service of thanksgiving at 2.30 pm on 9th February 2017 in Leicester Cathedral, and request that mourners wear bright colours. Family flowers only, donations in memory of Jill should be made to the Cathedral. The deadline for applications for this award has been extended to 31st March 2017. All other requirements remain the same, in particular the applicant must have been under the age of 18 on 31st December 2016. Full details, and a link to download an application form, are here. The members of the Southern District recently had an excellent ringing outing around the northern part of Dorset, organised by Mary Melbourne. It was a typical autumn misty morning when we arrived to ring at our first church, the 6-bell tower of St James’s just outside Shaftesbury. We then went to St Peter’s on Shaftesbury‘s High Street but there was time in the programme for a welcome cup of coffee. Most of us managed to get a coffee at the Salt Cellar café which is situated at the top of Gold Hill and which has a wonderful selection of cakes. Unfortunately we were unable to raise the second bell at St Peter’s, however we gamely carried on and managed to do a few bits and pieces on the remaining 5 bells, though it didn’t sound too pretty. We had lunch at Compton Abbas Airfield, a stellar choice as the views were wonderful (the autumn mist was clearing by this time), and such a lot of activity with helicopters and light aircraft buzzing around, and a good meal. In the afternoon we were kept busy with three towers to visit - Compton Abbas, Durweston and Bryanston School chapel with a nice ring of 8 bells. Some of us found Compton Abbas church hard to find as Sat Nav’s took us to the village rather than the church. Driving to the various churches through the Dorset countryside, however, was delightful as it was a still, sunny afternoon and the autumn colours were at their best. We all had an excellent day’s ringing on a mixture of bells, some more difficult than others, before driving home with a glorious red sunset glowing on the horizon and good memories of a most enjoyable day. Thank you to Mary for organising it all. At the AGM in June, Isabel Pearce was elected as an honorary life member of the Ladies Guild. Because of other commitments that weekend, Isabel was not able to attend the AGM to collect her certificate in person (not that she knew about the certificate! ), so she decided to join the walk between Wye and Canterbury, and raised £520 in sponsorship. Isabel was finally presented with the certificate during the South Eastern district outing to Oxford on 23rd July. Thanks to Julie McDonnell for the photos, and to Helen Webb for the information. Details on the AGM page here. Liz Davey retired as president, and Helen Webb was elected in her place. The other officers were re-elected unchanged; Rosemary Hemmings, Helen Webb and Jan Wyatt were elected as Central Council Representatives. 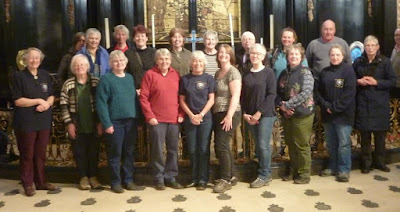 The ethos of Ladies Guild to bring lady ringers together nationally and to encourage new ringers has always been well met within the Ladies Guild holiday. It is a meeting of friends, new and old who share some social time together fostering great friendships. 2016 found 39 intrepid members meeting up again for our much anticipated Annual event – this year to Norfolk. We met at the spacious Country Club at Taverham just outside Norwich, our trip carefully planned with the help of several local area members - namely Elisabeth Spry, Theo Crowder and Betty Baines, and we were very fortunate to enjoy some wonderful towers during the week. We started on Monday with the 8’s at Happisburgh, Northrepps, Cromer and then Theo’s home tower at Holt. Cromer were augmented to an 8 in 2014 and very enjoyable, some excellent towers to start our holiday. Tuesday found us at the detached tower at East Dereham and climbing a delightful old wooden staircase - at 22 cwt they were a lovely deep sound - then on to the 9 cwt 10 at Gressenhall which were rather good too. Reepham after lunch, and then onto the six at Weston Longville to finish the day. On Wednesday we set off bright and early for the 8 at Felmingham followed by the 17 cwt 10 at Aylsham. Then we settled with our ice creams/sandwiches on the little Bure Valley train down to the boat at Wroxham and spent the next two hours ‘cruising’ on the Norfolk Broads with a varied commentary on much of the wildlife we observed, nice change. Back on the coach again we had just time for a quick ring at the Buxton ground floor 6 before heading back to the hotel for much needed sustenance! Thursday we set off for Raynham Park and the fairly new 8 there, rung on a mezzanine level through a trap door which proved quite a challenge to get everyone up and down within the time. Then onward to 10 cwt 6 Castle Acre and a leisurely lunch time to look around this most beautiful castle and priory area. The 8’s at Swaffham and Ashill finished our agenda for the day. Friday brought us to New Buckenham and Kenninghall and to meet up with our good friend Betty Baines and then on to Diss, her home tower. 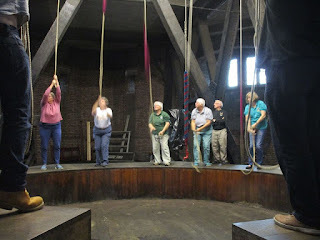 Here there is a very interesting arrangement of ropes ringing through some beams, a new experience, and lastly Redenhall - both these afternoon towers were 22 cwt and by now we were perhaps tiring a little, some of us very much looking forward to a drink and supper! And so on to Saturday and two light rings of 8 at Saxlingham Nethergate and Loddon, both ground floor, excellent rings, and then a free afternoon to wander in Norwich which completed our tour. All too soon it was Sunday and we were saying goodbye for another year. The great thing about the Ladies Guild Tour is meeting up with friends sharing their company and a common interest, memories of past misdemeanours and fun – and the week seems to fly by. Good planning, an excellent accommodating hotel with friendly staff and two lovely coach drivers completed our very successful week. It is a team effort to organise and as always, thanks to my co-organisers, Mary Sterry, Polly Osborne and Margaret Laver. Here’s to next year. Reports of peals rung for the Ladies' Guild since 2011 are now in the Performances section, here, including one rung on 29th May 2016 for the Queen's 90th birthday, and some other significant birthdays. If anyone has photos of peal bands which are not already included then please send them to the webmistress. Reports of earlier peals will be added 'soon'. 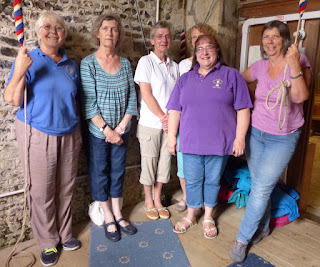 Following on from the successful quarter peal day held last year in the Andover, Hampshire area our second was held in the East Dorset area on Wednesday April 27th, Swanage being the home tower of one of our members Sally Jenkins. The day started cold, but bright and sunny, with six members meeting at Canford Magna Church in the grounds of Canford School. Following a successful quarter of Cambridge Surprise Minor some moved to Lychett Matravers and others to Corfe Mullen where they were joined by other members for further quarters. It was then off to The Bankes Arms, Corfe Castle for lunch. With the sky becoming darker and darker outside and a sudden hail storm we appreciated the warming soup and other delights on offer. Following lunch some stayed to ring at St Edward’s in Corfe Castle while others went on to the beautiful village of Worth Matravers enjoying the panoramic views of Swanage Bay en route. The day concluded with ringing at Swanage, one of the finest rings of 8 in Dorset (if not the finest!). They were indeed a joy to ring and a very enjoyable quarter of Grandsire Triples was rung, with thanks to Mike Jenkins for covering on tenor behind. We scored four out of the six quarters attempted with 15 members (and one associated ‘laddie’) taking part. Although it is always good to score, members were encouraged to participate in the day and quarter peals were planned to suit their varying levels of experience. Quarters scored included doubles, surprise minor and triples, with two ‘firsts’ achieved. Details of the quarters are here. Everyone enjoyed the day in this beautiful part of Dorset and maybe the Quarter Peal Day will become a permanent fixture in the yearly programme of events! Iris Webb, Daventry Branch Secretary from 1968 until 1985 (excluding 1981) died at Kilsby House on March 3, 2016 aged 90. Iris joined the Guild with husband Stan in 1954, took over as tower captain when Stan died in 1984 until February 2006 by when dementia was so severe that she moved to Kilsby House. During Stan and Iris’ time, Staverton practices were a local centre of ringing and well attended. They were also active handbell ringers. Their four children were of course required to ring and son John still lives in Staverton where Iris ran the Post Office in the hall of the house for several years. There will be a private cremation. A celebration of Iris’ life will take place at Staverton Church with the Revd. Liz Cowley (the most recently retired Vicar of Staverton), on Wednesday, April 27 at 3 pm. 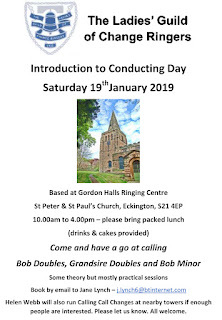 There will be open ringing before and after the service, organised by Richard Hartley who would be pleased to know in advance of anyone who wants to ring, so that the appropriate arrangements can be made and notified. Iris was also a life member of the Ladies Guild Northampton District from its inception in 1977. She was Vice President from 1977 to 1978. For updates, corrections or suggestions, contact the Webmistress (janet.garnett_at_metapurple.co.uk), or use the Contact form here.